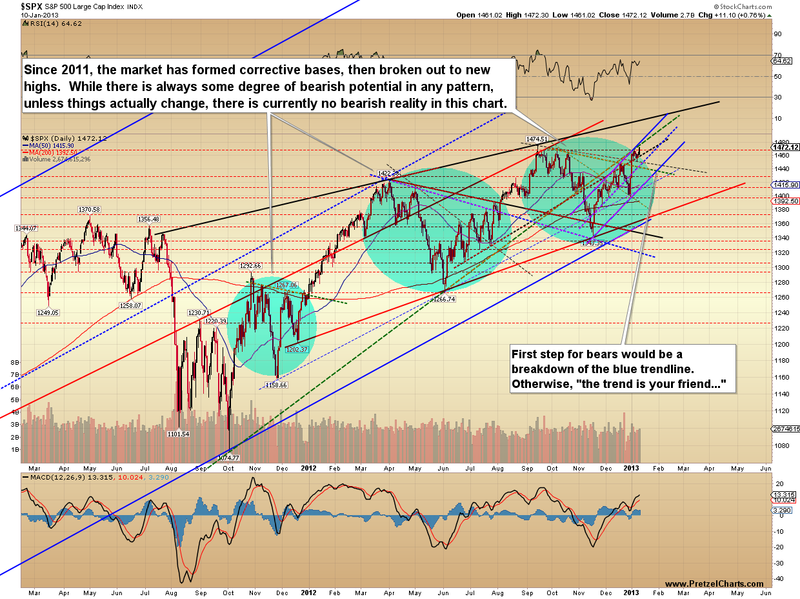 Pretzel Logic's Market Charts and Analysis: The Pattern Repeats: Is It Really This Simple? The Pattern Repeats: Is It Really This Simple? Last update noted that new highs were expected directly, and the market has obliged and now kicked out some key intermediate levels to the upside, suggesting the rally will continue. 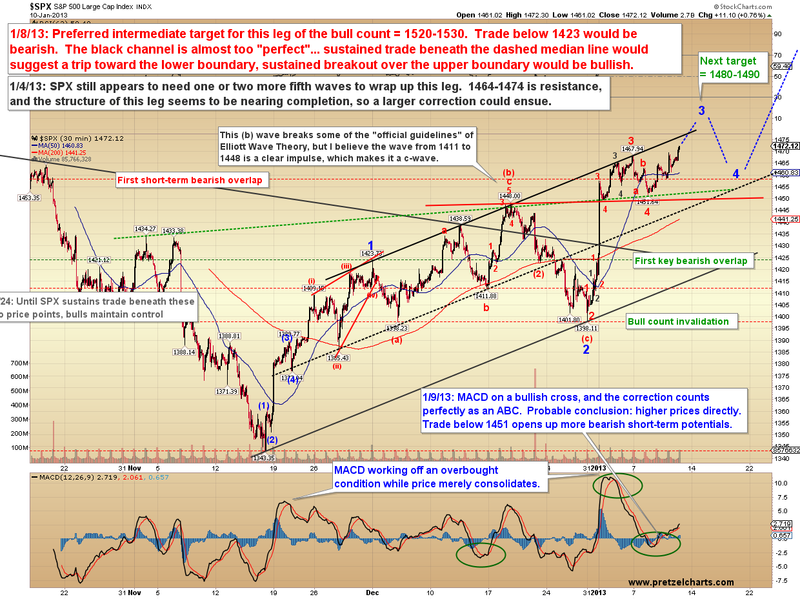 There's really not much to add to the bullish expectations and projections of the last couple weeks-worth of updates, and the market continues to perform in line with my preferred bullish wave counts. I'm anxious to see if my intermediate target of 1490 +/- from November will be reached on this leg, as it's something of a long wait between the time an intermediate projection is published and the time the market actually reaches it (or doesn't). There's still nothing in the charts that's screaming "sell!" When looking at a long-term chart of the S&P 500 (SPX), we can see obvious similarities between the current pattern and the last two rallies. While the market always reserves the right to create confusion or to have a pattern fail, the present pattern is quite bullish, and a trip into the mid-high 1500's would be an entirely reasonable result. I'm also reprinting the zoomed-in December 2011 fractal, because I do think it's relevant. The updated 30-minute SPX chart is shown below. Assuming the recent rally off 1451 doesn't mutate into something more complex or unusual, it appears ready to move higher. 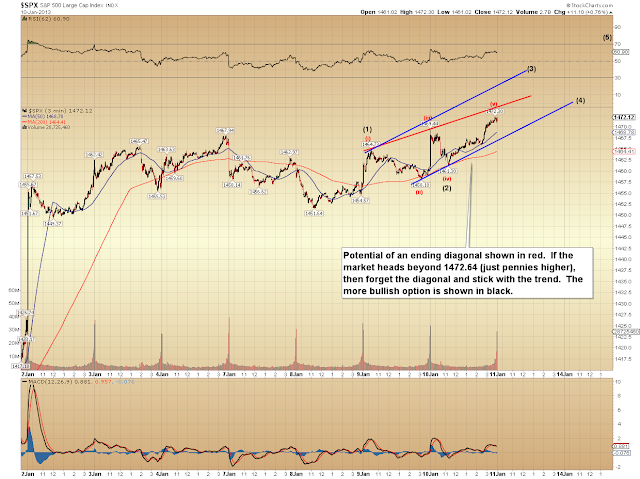 One option for a slightly different take on this most recent rally leg is shown below. The option of an ending diagonal can be ruled out if the market moves just a few cents higher. 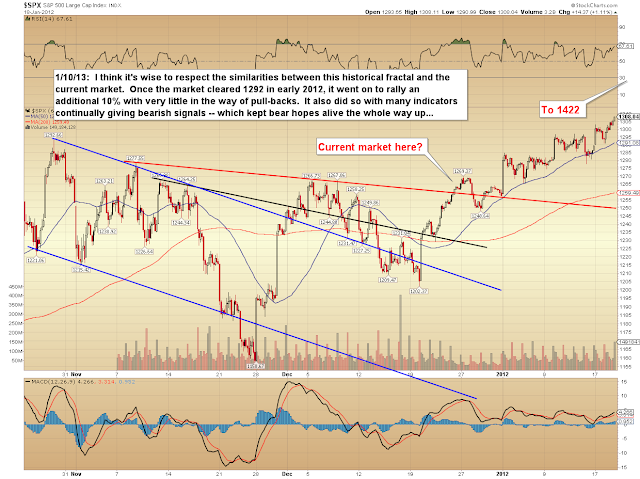 In conclusion, I continue to feel it's unwise to front-run this market in a bearish fashion -- as I opined on January 2, this is a third wave, and basically that means it's best to simply ride the trend. The only reason I'm still slightly hesitant to publish much in the way of very long-term bullish projections is that the market hasn't quite crossed over the long-term inflection points it's reaching. Projections are defined by such inflection points -- assuming those levels are crossed (for example, 902.30 on the Russell 2000), then it will become much higher probability that we are in a long-term bull market. Trade safe.